We believe in supporting programs that encourage youth to pursue careers in mining and to create long-term socio-economic benefits in the communities where we operate. This past summer, our Éléonore mine in Northern Québec welcomed several new faces to its workforce with its Summer Student Employment Program (SSEP). 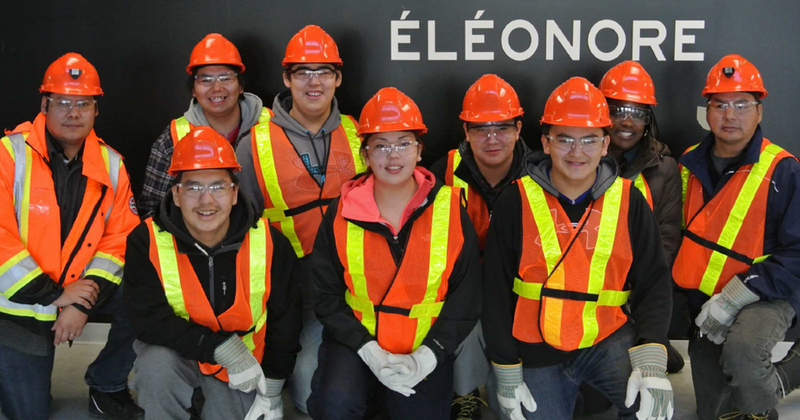 The SSEP was launched as an opportunity for Cree students at a post-secondary education level to learn more about the mining industry. The SSEP differs from classroom training in that it allows students to build skills through hands-on work experience alongside miners and employees. The program is in its third year. This past summer, six students got to work in different areas of the mine, from surface maintenance to catering and administration. Allowing the students to experience these different roles gives them a broad understanding of the different areas that make up a mine site. The SSEP was created in partnership with the Cree Nation Government’s Cree Human Resources Department (CHRD), which provides skills development, training programs and employment services to assist Cree and non-Cree community members with preparing for and maintaining jobs, while also building fulfilling careers.